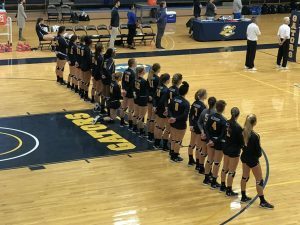 First-year volleyball student-athlete Claire Klima, ‘22, kneels in her team lineup during the national anthem at a home game on September 22, 2018. 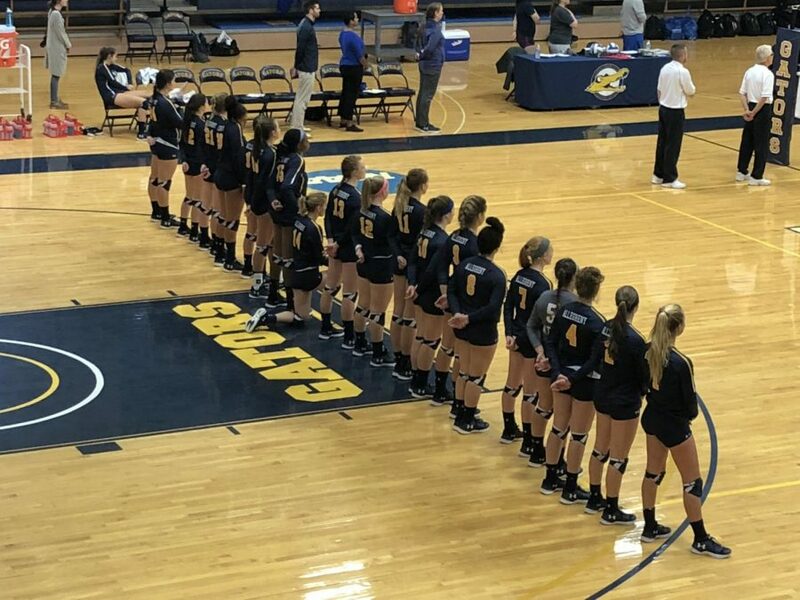 Allegheny volleyball player Claire Klima, ’22, is hoping to start a conversation that begins on the court and expands onto campus. 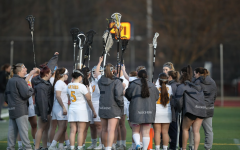 The first-year athlete has been kneeling during the national anthem at every game during the fall 2018 season. Klima was able to witness this inequality firsthand in her home state of Michigan. She said she first began kneeling in protest while on the Lincoln Consolidated High School volleyball team in Ypsilanti. Klima was not the only athlete on her high school team to kneel. She said her team’s choice to kneel often sparked deeply divided reactions from spectators, ranging from social media criticism to having objects thrown at them on the court. “(There were) just violent reactions, but that only made it seem that much more important to participate in,” Klima said. 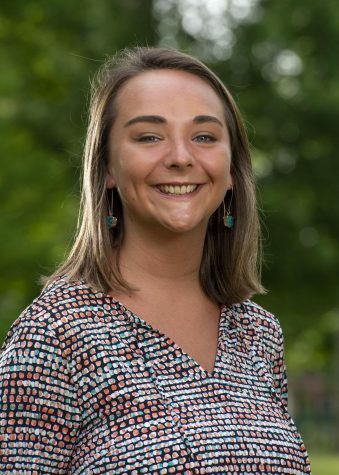 Klima’s inspiration has not lessened since coming to the college, according to Klima, who said that she knew she wanted to continue kneeling when she came to Allegheny. 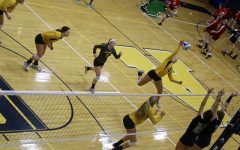 Head Volleyball Coach Kelly Barzak and Assistant Volleyball Coach Ashley Donnelly declined to be interviewed. Klima said her actions are not new to the athletic department — the women’s basketball team took place in a similar protest last year, according to Klima. She said the protocol for the department’s response was established when she came to her coaches about kneeling. Klima was asked to find the contact information for the coaches of all the teams Allegheny would face in the upcoming season so that Interim Athletic Director Bill Ross could send an email at the start of the season explaining Klima’s intent to kneel before games. Klima said she also engaged in a conversation with her teammates to inform them of her intentions. “It’s not something that they’re necessarily against, but definitely not something that they fully support,” Klima said. Athletes from other teams have had positive reactions to Klima’s actions, Klima said. Her own team has been largely neutral in its reaction. According to Klima, she invited any of her teammates who may be “offended or confused” to have a conversation with her. Spectator reactions have been relatively calm, Klima said. While she keeps her head down in an effort to avoid looking at the crowd, friends and teammates have told her about commentary and pointing among fans. Klima is planning to kneel for the rest of her career at Allegheny. She says she is also hoping to become more politically involved on campus.